Sometimes my readers have some incredible recipe ideas. I love when you share those with me, whether it be via email, comments, or messages on social media. It’s no secret that I love Eclair Cakes. I’ve made traditional, pistachio, strawberry, and peanut butter. 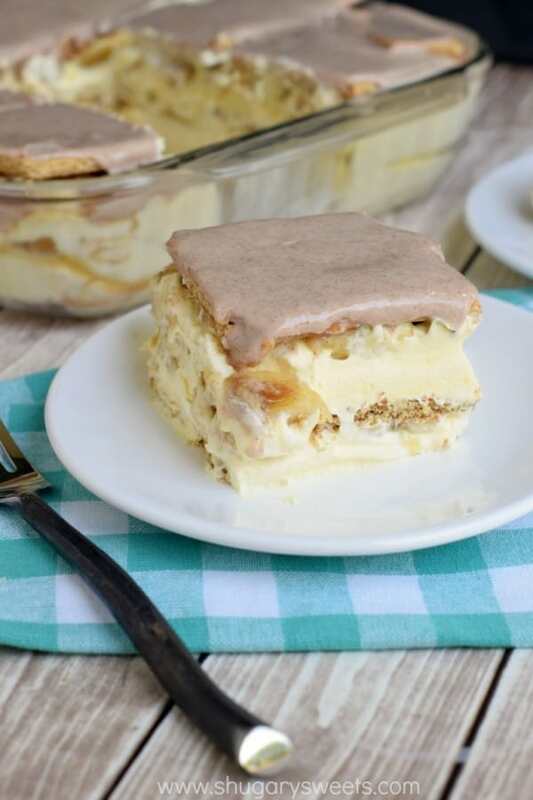 I had a reader inform me that she made my peanut butter eclair cake and added bananas. My mind went WHAT?!?! I love that idea. And that’s where today’s version originally started out. But then I realized, we were out of peanut butter. And graham crackers. And I was craving something sweet. Only, in saving him, I ruined my chances of eating healthy for the day. One bite of this Banana Eclair Cake and I knew game over. I immediately texted my sister in law and offered to drop off dessert. I found this to be THAT good. The kind of dessert that I know I would take a fork to every time I opened the refrigerator (anyone else do this??). When layering the graham cracker on top of the bananas, place them upside down so that the cinnamon sugar side of the cracker is touching the banana. As the cake chills out in the fridge, the cinnamon sugar caramelizes on the bananas. I found this out by accident. A very happy accident. Give your cake plenty of time to chill. I suggest a minimum of 4 hours. The goal is to allow the grahams to soften. They taste better, and they CUT better once soft. You can even make this the night before! When cutting, use a serrated knife. It helps cut through the grahams a little better. Don’t expect each piece to be served in a beautiful presentation. They will slide, and fall, and it’s OKAY. So now that you have the perfect Father’s Day dessert…or 4th of July potluck recipe…good luck not eating it all yourself! 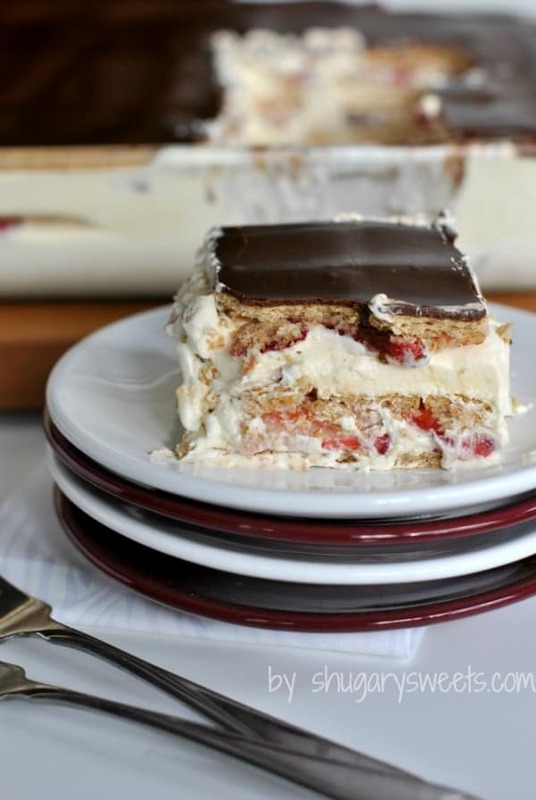 Strawberry Eclair Cake: use those fresh berries to make this seasonal dessert! 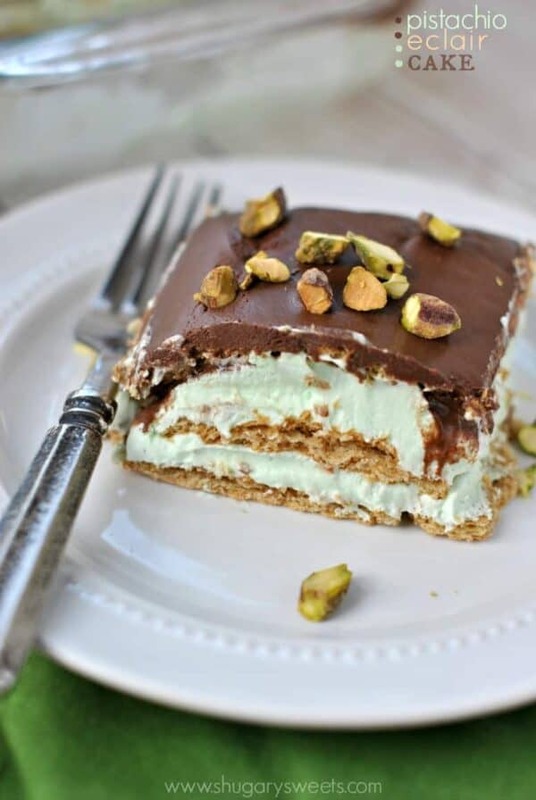 Pistachio Eclair Cake: Such a fun twist with pistachio pudding!! 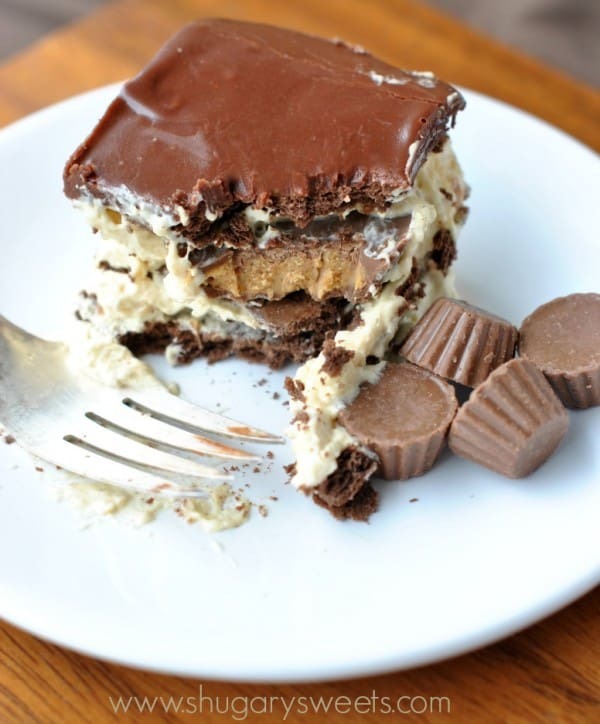 Peanut Butter Eclair Cake: made with chocolate grahams, peanut butter, and Reeses. This should solve all cravings! In a medium bowl, combine the instant pudding with the milk. Whisk together for several minutes until smooth. Allow to thicken, about 5 minutes. Fold in the Cool Whip and set aside. In the bottom of a 13x9 baking dish, place a single layer of cinnamon crackers (cinnamon side UP). You may have to break some of the crackers to fit, don't worry if they overlap. Pour half of the pudding mixture over the crackers. Top with half of the sliced bananas. Place the next layer of crackers over the bananas, cinnamon side DOWN. Top with the remaining pudding mixture and remaining bananas. Place the final layer of crackers over the bananas, cinnamon side DOWN. In a small bowl, whisk together the glaze ingredients until smooth. Pour slowly over the top layer of crackers. 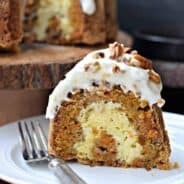 Refrigerate cake for at least 4 hours, or overnight. Slice and serve. Store remaining cake in refrigerator for up to 3 days. ENJOY. **If you can't find the instant french vanilla pudding mix, just use the instant vanilla instead. 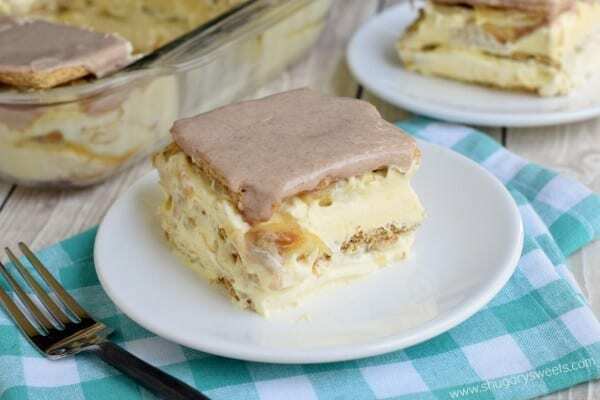 *Today’s Banana Eclair Cake recipe was originally published on Shugary Sweets on June 17, 2015 and has been republished in June 2018. Aimee this looks amazing! Pinned and this is going in the must make file! Thanks for sharing. I loved those Cinnamon Graham Crackers as a kid too, Michael has good taste 🙂 Loving everything about this summer dessert! That eclair filling looks amazing! 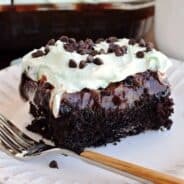 Such a simple dessert that is perfect for summer! OOOh! 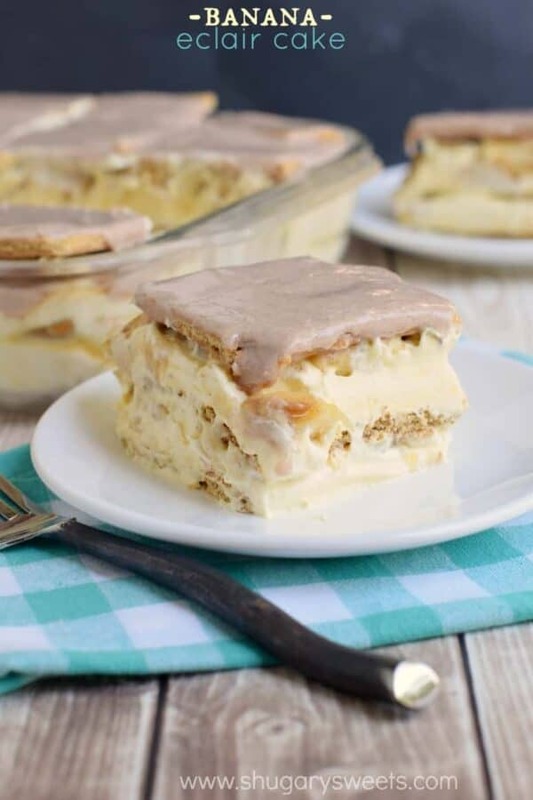 I totally need this eclair cake in my life! Thanks for sharing it looks amazing! That cinnamon glaze does it for me. Wow. Readers DO have the best ideas, and it’s great when they share. You adapted her idea really nicely. And next time, you can try the PB/banana! 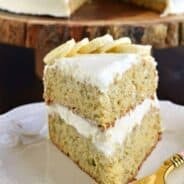 I would never guessed that this cake is no bake, there are no excuses noy to make it in this case, love the flavor and how creamy it is! What a fun way to incorporate a reader idea with your awesome baking skills. Well no bake skills really 🙂 I love the banana and cinnamon layers going on here!!! Perfect picnic food right there! I am kiiiiiinda loving this cake!! Your elcair cakes are my favorite! Love this banana version inspired by your reader 🙂 The cinnamon graham crackers are such a delicious idea too! I loved cinnamon graham crackers as a kid too. I could just sit and eat those babies all day long. 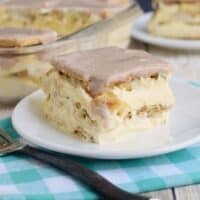 This eclair cake looks delicious and my hubby would love so love this. I totally take a fork with me to the fridge for just “one” bite. hehe. I love the idea of these banana eclairs along with the cinnamon graham crackers (and I´m sure your hubby didn´t mind too much since he get to taste this *smile*). I also love the idea of pairing it with peanut butter. YUM! In your notes the first one said, (when layered the cake, place the grahams on top of the bananas upside down. So that the cinnamon sugar side of the cracker is touching the graham.) Do you mean cracker touching the banana??? I kept reading and that is the way I think you mean. Man, I love this idea! Banana is one of my favorite dessert flavors, how did you know?! 😉 Gotta love genius readers, right?! omg this would be my mom’s DREEEAM-she’s also a big cinn grahams fan and always all about banana desserts!! love it! I love this idea! My husband is nuts for banana anything, so this is perfect . I accidentally bought the cinnamon grahams this summer and they were fantastic. It added a really great flavor to what I was making. I feel weird talking about depth of flavor with a boxed graham cracker, but it’s real, lol. Cannot get enough of it. My kidos are loving it even more than me.